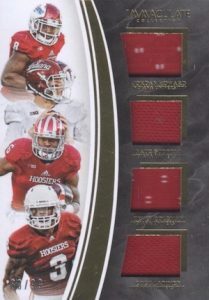 Although Immaculate is again extended to the world of college athletics, 2016 Panini Immaculate Collegiate Football narrows the focus to only those associated with the pigskin. Every premium box includes five autographs or relics. Dropping one per box, the base and parallel cards are more like the appetizer when collectors came mainly for the steak. 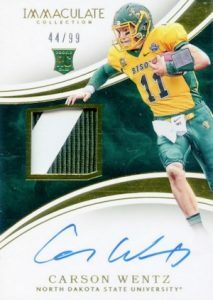 In that regard, 2016 Panini Immaculate Collegiate Football delivers with multiple hits to chase. Signed cards cover many schools and themes with a focus on the most notable past players. The main Autographs set includes a mix of choices as well as 1-of-1 Platinum parallels. Featuring only the very best, Immaculate Ink documents the Hall of Famers from college and pro football. While football is the central theme, Sports Variation Autograph Memorabilia spins off into baseball and basketball subjects in addition to football. 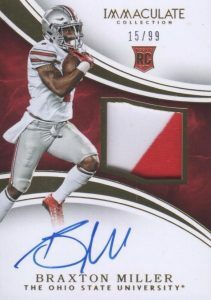 Drawing from the more current group of players with on-card signatures, Immaculate Numbers (#'d to jersey number) highlights key names from the 2016 NFL Draft with an autograph and design that centers on their college number. 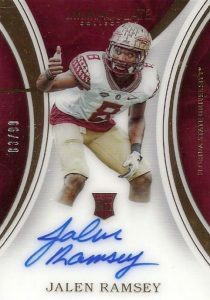 Premium Patches Autographs adds a large relic swatch to the signature for the incoming rookies. 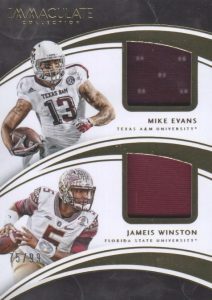 2016 Panini Immaculate Collegiate Football also brings college relics into play with several inserts. RPS Rookie Caps features a jumbo piece of even-worn hat. Pairing relics from four players who played at the same school, Immaculate Quads come as a main version and a Brand Logo (1/1) parallel. More relic variety is reserved for Helmet Team Logos along with Immaculate Chin Straps, Cleats, Gloves, Jersey Numbers, Laundry Tags and Team Logos. 2016 Immaculate Collegiate 99 Devontae Booker Auto RC RPA Broncos !!! 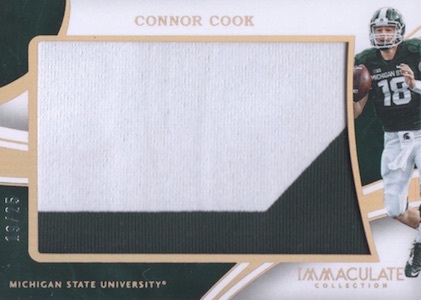 CONNOR COOK 2016 IMMACULATE COLLEGIATE JUMBO ROOKIE JERSEY 99 99! LAST ONE MADE! 2016 IMMACULATE COLLEGIATE MARK McGUIRE AUTO VERY LOW #'D 01 10. 55 cards. Serial Numbered #/99. PARALLEL CARDS: Red #/25, Blue #/10, Gold #/5, Platinum 1/1. PARALLEL CARDS: Red #/25 or less, Blue #/10 or #/5, Gold #/5 or 1/1, Platinum 1/1. 48 cards. Serial Numbered #/99. PARALLEL CARDS: Gold #/25, Platinum 1/1. PARALLEL CARDS: Gold #/25, Platinum 1/1 (No card #118). 48 cards. *Card #144 print run not provided. PARALLEL CARDS: Gold #/10, Platinum 1/1 (*Card #118 not included). 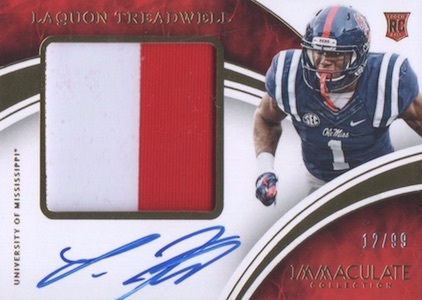 PARALLEL CARDS: Team Decals #/9, Conference Logo 1/1, USA Flag 1/1. PARALLEL CARDS: Prime #/25 or less, Tags 1/1. PARALLEL CARDS (No card #3*): Prime #/25 or #/5, Tags 1/1. 18 cards. Serial Numbered #/4. PARALLEL CARDS: Prime #/30 or less. 19 cards. Serial Numbered #/49. PARALLEL CARDS: Gold #/5, Platinum 1/1. 39 cards. Serial Numbered #/99. PARALLEL CARDS: Numbers #/25 or less, Logos #/15 or less. All subjects not included in parallel. View specific options with the full spreadsheet. 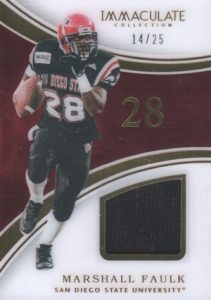 PARALLEL CARDS: Brand Logo #/2 (No card #22,27), Button #/2, Team Logo #/2 (No card #22). If anyone comes across any of the Smallwood pieces, my eBay is mattby. I’ll have money waiting for you. Much thanks! 375 is a fairly hefty price, I can’t justify spending that just on the chance of coming across the slim amount of WVU cards. However the hits seem fun and interesting. Not a whole lot of difference between this and last year’s Immaculate sets. My question is how many more Immaculate’s will they release before they fill the redemptions from last year’s Immaculate football (released in December, 2015). About half of the rookie class (Amari Cooper, Devante Parker, Jeremy Langford, Karlos Williams, Tevin Coleman, just off the top of my head) were redemptions in the product, and none of them have filled. National Treasures releases four months later, and guys like Cooper were redemptions in that product, and they were filled within weeks. So frustrating.